Update (06/19/18): It looks like someone prematurely revealed a host of details about the upcoming Google Podcasts app. According to a comment on ProductHunt attributed to a Google employee (h/t: Android Police), the app will deliver personalized recommendations based on your subscriptions and listening habits. Got a Google Home? Then you’ll be happy to hear the Google Podcasts app will sync across platforms via Google Assistant. This means you can listen to an episode on your Google Home, then finish it on your phone (or vice versa). Other nuggets of information include over two million podcasts indexed, availability in over 47 languages, and the ability to subscribe to and download podcasts. The employee adds that there’s no iOS app available today just yet, but the core podcast experience should still be the same if you prefer using Google Play Music. In any event, the app is essentially a shortcut to the podcast functionality found in the Google Search app. You might want to visit our list of best podcast apps if you’re looking for something a little more powerful. Original article (06/08/18): Although Google has made it clear that it places the utmost importance on podcasts and the future of podcasting, it strangely doesn’t have a dedicated podcast app. As of now, it pushes that responsibility to Google Play Music. 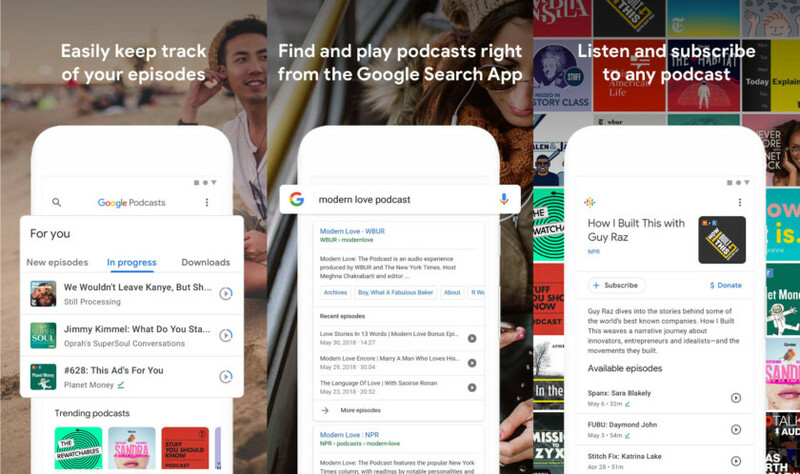 However, 9to5Google spotted some information at the end of May that pointed to Google integrating a podcast feature into the official Google Android app. Now, today, the same publication found that there will also be a dedicated Google Podcasts app on the Play Store. Now, this is where things get a bit confusing. It is not likely that the Google Podcasts app will be a standalone application. Rather, it will be more like Google Lens in that the Lens feature is baked into Google Assistant and the “app” you download from the Play Store is simply a shortcut to that feature. 9to5Google expects the Google Podcasts app to simply be an icon you can place on your home screen or in your app drawer that will directly launch Google Podcasts from within the Google app. In other words, you’ll need the official Google app in order for the Google Podcasts shortcut to work. While this seems counterintuitive (and overly complicated), it is nice to see that Google is bringing some sort of podcast functionality to something other than Google Play Music. While GPM certainly does podcasts fine, it doesn’t do it nearly as well as it does music and feels more like a tacked-on feature than anything else. There’s no telling when we’ll see this podcast functionality, but it should be relatively soon, as so much information is now available on the features. Stay tuned!